Traditional authentic ramen broth can take hours to make. I’m using a few shortcuts to keep things super simple so you can have a warm bowl of nourishing ramen on the table in about 20 mins. The secret? Using packaged Bone Broth as the soup base and adding fresh garlic and ginger, soy sauce and a touch of hot chili oil (or sriracha) for extra flavor. Prepared bone broths are made by simmering bones, vegetables and herbs/spices low and slow for hours (like 24 hours!) to extract as much nutrition from the bones as possible. 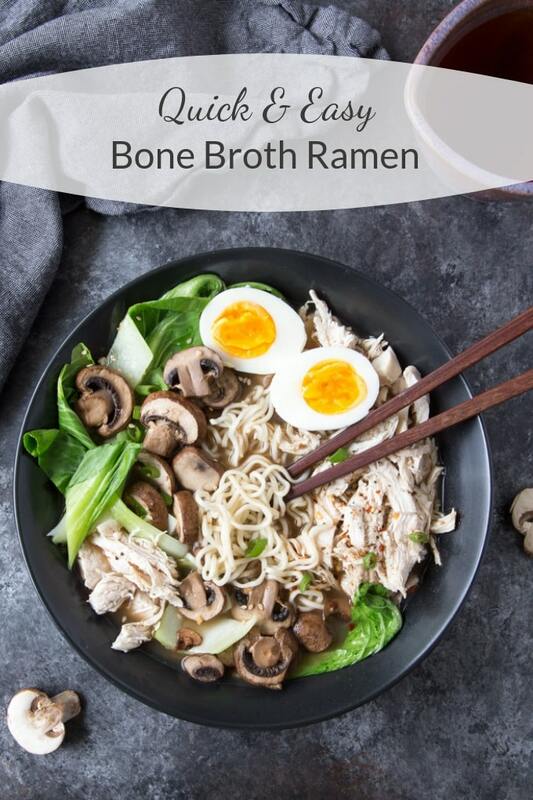 Using packaged Bone Broths means getting all the extra nutritional value and flavor without the lengthy process of cooking the bones ourselves. They make a great base for this nutritious, healthy ramen bowl. Why bone broth vs. traditional chicken broth? This recipe can absolutely be made with either bone broth or traditional chicken broth. I’m opting to use bone broth to up the nutrient factor of this ramen. Bone broth is rich in nutrients and amino acids that may help with improving gut health and strengthening the immune system. Bone broth is also rich in collagen a protein that’s known to help build stronger joints, teeth, nails and hair. These days it’s pretty easy to find bone broth at your local grocery store. It comes in shelf stable containers in the soup aisle (like this Kettle & Fire Chicken Bone Broth I used) You’ll likely find bone broth options in the refrigerated or frozen sections as well. Each brand will have slightly different flavor, so you might want to experiment with a few to find one that you really like. I like Kettle & Fire because they use lots of veggies in their chicken bone broth (like celery, onion, carrots, garlic, peppers and herbs) so it has a really nice flavor. What type of Noodles do you use for Bone Broth Ramen? Instant– For this recipe I’m using instant ramen noodles just to keep things quick and easy. You’ll find many different varieties of instant ramen noodles at your local grocery store. We’re not going to be using the flavor packet so it really doesn’t matter which flavor you pick. Dried– Many grocery stores also carry dry ramen noodles( look for them in the Asian/International section of the store) . Similar to packaged spaghetti . If you elect to use dried ramen noodles vs. Instant noodles, I would suggest cooking the noodles according to the package directions first and adding them to the hot ramen broth (along with the Bok Choy) for a minute or so before serving to warm them up. You could also use thin spaghetti, udon or soba noodles as well. Fresh– If you’re lucky enough to have a place to purchase fresh ramen noodles then by all means do that! You’ll find them in Asian grocery stores in the refrigerated section. Add to the ramen broth a few minutes before serving to warm them up. Gluten- Free– You can easily make this dish Gluten-free by using gluten-free ramen noodles. Some of my favorites are rice ramen noodles made by Lotus Foods. I love that they have so many different varieties like jade pearl rice and forbidden black rice. Cook according to package directions and add to hot broth for a few minutes before serving. Available in many grocery stores and Whole Foods Markets. Low Carb– Try Shirataki noodles. Shirataki noodles are very low-calorie/low carb noodles made from Japanese konjak yams or some varieties are made with tofu. Perfect for those following Keto /Low Carb or gluten-free diets. 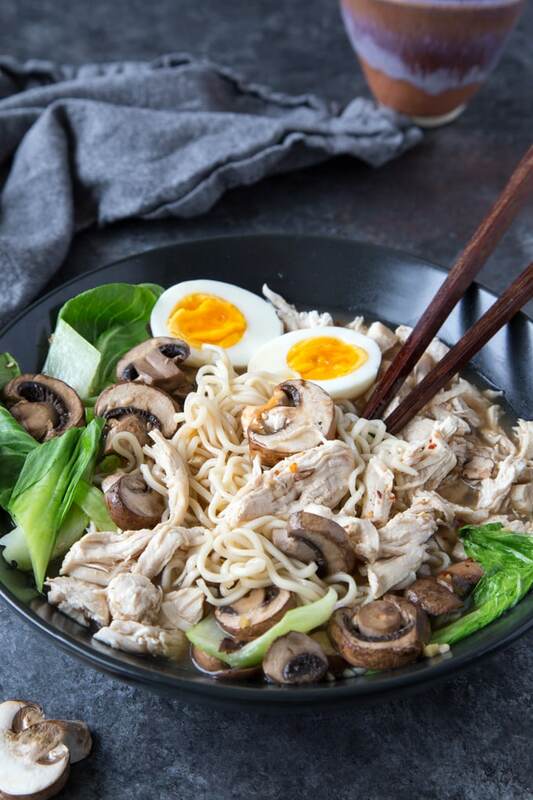 Shirataki noodles can generally be found in the refrigerated section in your grocery store near the tofu or on Amazon (sometimes called “Miracle Noodles”) . Cook according to package directions and add to hot broth for a few minutes before serving. You can easily prep both the eggs and the chicken ahead of time. This recipe is already quick and easy but if you’d like it to be even quicker you can prep the eggs and/or the chicken ahead of time. Eggs can be cooked up to three days ahead. You can warm eggs up if desired by immersing in a pot of simmering water for 1 minute before serving (shells on). Chicken can be cooked in a medium pot of boiling water or broth. Cooking until chicken breast is thoroughly cooked (about 8-10 minutes). Remove chicken breast from the pot and allow to cool to touch. Use two forks to shred chicken (alternatively you can slice the chicken breast into strips). Store in an airtight container until ready to use. Don’t forget to spice it up! Just a couple of drops of hot chili oil (found in the Asian section in most grocery stores) or Sriracha ( or even a pinch of red pepper flakes) is such a game changer! If you’re not into spicy and opt not to add hot chili oil or sriracha you may want to add additional garlic, ginger and soy sauce for extra flavor. 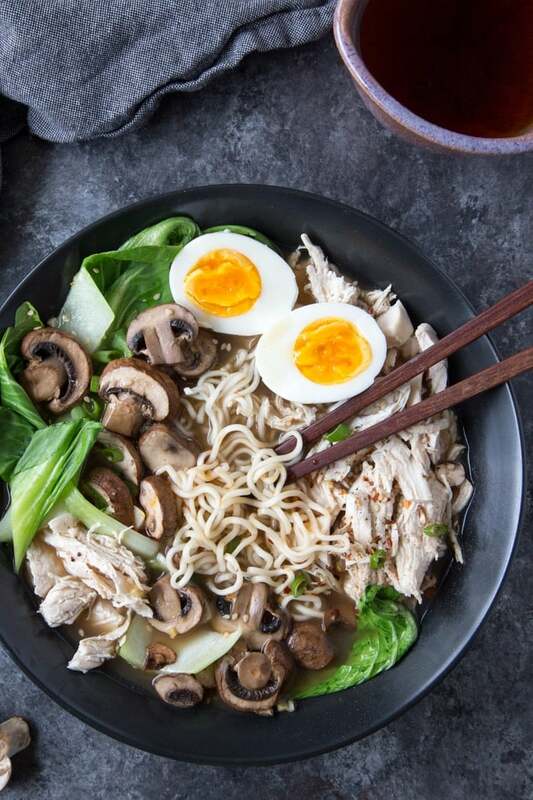 You might also like Healthy Chicken Ramen Bowls – loaded with chicken, ramen noodles, cabbage, carrots and green onions and a soft set egg. Bring a medium pot of water (enough water to cover eggs ) to a boil over medium-high heat. Once water has reached a boil, carefully lower eggs into water using a slotted spoon (or thongs). Cook 7 minutes. Meanwhile, prepare a small bowl with ice water. Once 7 minutes have passed remove eggs from pan (with a slotted spoon or thongs) and submerge in ice water for 2 minutes. Remove eggs from ice water and set aside. Return pot to stove and add olive oil over medium-high heat . Add garlic and ginger and cook until fragrant (about 1 minute). Add bone broth and soy sauce, stirring to combine. Bring to a boil. Reduce heat to simmer. Add mushrooms and ramen noodles (do not include the flavor packet if the noodles came with one) to broth. Cook noodles according to time indicated on package (approx. 3-5 minutes). When you have 1 minute cook time remaining add shredded chicken back to the pot and add bok choy. Divide soup between four bowls. Peel eggs and slice in half. Add 1 egg ( 2 halves) to each bowl and garnish ramen with sesame seeds, green onions and a drizzle of hot chili oil (or a pinch of red pepper flakes). *Hot Chili Oil- Just a couple of drops of hot chili oil (found in the Asian section in most grocery stores) or Sriracha ( or even a pinch of red pepper flakes) is such a game changer! If you're not into spicy and opt not to add hot chili oil or sriracha you may want to add additional garlic, ginger and soy sauce for extra flavor. For Gluten-free option- Use coconut amino instead of soy sauce and look for gluten free rice ramen noodles ( I like Lotus Foods brand), or use gluten-free spaghetti. 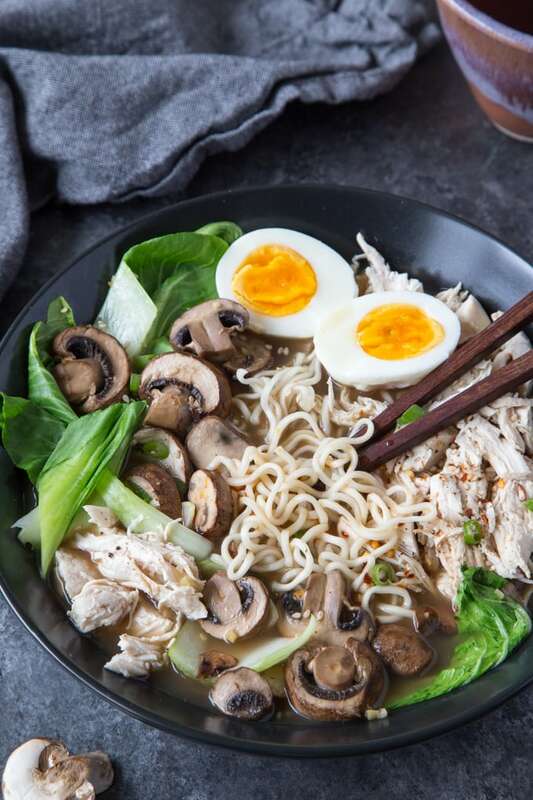 For Low- Carb option- replace ramen noodles with Shirataki noodles (sometimes called "miracle noodles" found in the refrigerated section in the grocery store). Nutritional Info w/o noodles (for those who want to substitute low carb noodles)- Calories: 261, Fat 10.4 g, Sat. Fat 2.4 g, Sodium 507.4 mg, Carb 2.9 g, Fiber 0.3 g, Sugar 1.4 g, Protein 37.9 g.